I’ve been toying with writing about this topic for a while now. More than a year if I’m honest. Quite how successful I’ll be at spelling it all out, and getting my point across, remains to be seen. In simple terms, and of course in my opinion, the synopsis is this: The manner in which a competitive international marathon is contested and won has changed. Not a gradual evolution, but a rapid step change, set in motion on the day Samuel Wanjiru won the Olympic gold medal in Beijing in 2008. Naturally we didn’t fully grasp the enormity of it at the time. It was an astonishing performance yes, one of the best of all time. But the effect it would have on marathons from then on was what truly defined it. All we knew was that the Olympic marathon had been won in a way never seen before. Beijing was an aggressive non-conservative attritional race. It was full of pace surges – FROM THE GUN. Fast marathons had been run before but never like this. In the past they had been even-paced or sometimes fast-paced early on, with slow decays to the end. Fast times were obviously still achieved (Steve Jones in Chicago 1985 for example. Halves of 61 and 66) for what was then a world record and is still the UK record. Beijing was different. It wasn’t a fast but even pace. It was fast no question, but it was the surges Wanjiru threw in, oh the surges. Starting inside the first 10km, they were incredible. They were what set this race apart from those preceding it. The conditions it was run in are worth more than a mention. They add significantly to the unbelievable nature of what was happening. Beijing was hot (30 degrees?) and humid. It was no place to toying with human performance and pushing your body to speeds teetering on the thin edge of what normally would be considered the top end of what can be achieved in ideal conditions. Yet it was happening. The group was whittled down to the truly world class in a matter of minutes. And the group of super-elites that reminaed at the front, then began shrinking one by one, as the athletes realised there would be no let-up in pace from Wanjiru, not today. Martin Lel, Luke Kibet, one by one they were falling by the wayside. Wanjiru was racing it like a cross country race. Or perhaps a 5k on the track with a strong runner not wanting to leave it to a final lap burn-up. Only Moroccan Jaouad Gharib and Ethiopian Deriba Merga were able to cover the moves for any length of time. Indeed Gharib got dropped a number of times but somehow managed to keep the gap under control and come back when you were convinced he was now gone for good. A truly gutsy performance. Merga covered the moves better than Gharib and in truth, was the only one who could live with what Wanjiru was doing. 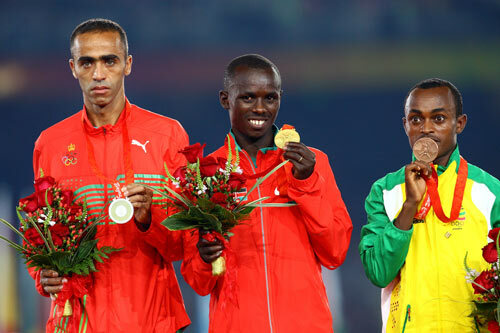 He ran himself into the ground hanging onto Sammy and ultimately, lost out on a medal to his fast-finishing countryman, Tsegay Kebede. Since then, the age of the super-fast marathon arrived. 2:06 became 2:05. Suddenly a pair of Kenyans were running 2:04 in Rotterdam. Paris, Berlin, Chicago, everywhere big city marathons were having their course records reset. Wanjiru arrived in London after his Olympic success, and the pace was ludicrous. He hurried the pacemakers up, repeatedly urging them on to the point that the pace at the 10km mark projected a 2:01 marathon. And he was throwing in lung-bursting surges anytime there was a drop in pace. He finally killed off the pack around the 20 mile mark and ran home unchallenged for another low 2:05. In light of recent events I certainly hope we have not seen the last of Sammy Wanjiru. He has added a new dimension to marathoning that is not wasted on the many aficionados around the world. We owe him and his crew of fellow crazies (Kebede, Merga, Kibet, Makau, the list is growing) a debt of thanks. We’re experiencing a golden era in marathoning that we may only fully appreciate many years down the line. And when we look back on it and go “Wow, that was awesome”, we will remember it all started in Beijing 2008. I completely agree with your closing comments Mark. I get so excited every time a big marathon comes around because of the great number of really fast guys who could smash up the world record, or at the very least have a cracking race (eg Rotterdam, Berlin and Chicago last year). Your blog was recommended on Facebook by the guys at Marathon Talk. It didn’t disappoint. Very insightful blog. We got up in the middle of the night to watch the Olympic marathon while we were on holiday – I can clearly remember how unbelievable that race was, we couldn’t believe anyone would have the brass neck to race a marathon like that. It really did change things… Excellent post. I was at the finish in Berlin in 2008, I’ll never forget the excitement, and how we thought then that the marathon had changed, then to watch Sammy challenging time and again was an absolute pleasure. A well written article – thanks, just a pity that such a tragic event has brought it to the forefront.